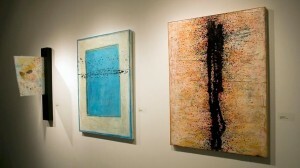 Fused plastic and acrylic portraits of abstractions by Paula Maratea Fuld at Gallery 110. Seattle’s lively gallery scene fires the imagination with innovative takes on well-worn artistic genres and edgy reinventions of cultural clichés. Here’s how some of our favorite galleries are turning art on its head in the coming weeks. Gallery 110 (110 3rd Ave. S) is hosting a double exhibition now through June 2 that shakes up the tame old genre of the portrait. Véronique Le Merre, a Washington-based artist born in France, presents “The Little Enchanted World of Fairy Tales” such as the Brothers Grimm and Charles Perrault never imagined. Her bright and brilliantly executed portraits of fairy-tale mainstays such as Snow White expose the darker undercurrents in the stories. Disturbing, sensual and thoroughly modern, Le Merre’s work neatly subverts the Disneyesque sanitizing of folk literature. In contrast, the gallery’s director and accomplished abstract artist, Paula Maratea Fuld, examines the genre of portrait at a keen philosophical distance. In her own show, “Portraits of Abstract Thought,” fused plastic compositions and acrylic canvasses pop with color, shape and texture, drawing attention to the framing and positioning that subtly underlie the most artless of portraiture. Fuld portrays abstract shapes as you might a person, and the play of transparency and opacity in her pieces challenges you to view them and re-view them anew from different angles. Next door at artists’ collective SOIL (112 3rd Ave. S), a group exhibition entitled “Text Editor” explores the nature of language through art, now through June 2. Via sculptural representations of shattered books; word play in print and letterpress; and linguistic misfire in video as well as static media, the show breaks words down to their most basic visual, phonic and semantic elements. Curated by Sharon Arnold, the exhibition features work by Erin Frost, Lynda Sherman, Joey Veltkamp, Amanda Manitach, Troy Gua, Jason Hirata, Garek Jon Druss, Izzie Klingels, Dumb Eyes, Eddy Dughi, Erin Shafkind and Cait Willis. At Greg Kucera Gallery (212 3rd Ave. S) through June 30, you can catch an exhibition of quilts and prints by artist Loretta Bennett, a fifth-generation quilter from the tiny Alabama community of Gee’s Bend. Its traditions of exquisitely stitched quilt work go back over a century, but Bennett forgoes familiar geometric patterns and fabrics in favor of bold, solid colors and irregular angles. The visual punch of these dynamic, asymmetrical patchwork creations is also captured in limited edition etchings. Curious? Hear more about it from the artist herself, who will be speaking at the gallery on Saturday, June 9. 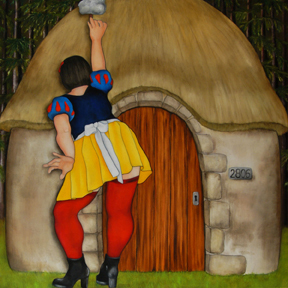 "The Seven Dwarfs' New Maid" by Véronique Le Merre. Courtesy of Gallery 110.